Two Design Locations: Charlottesville and Crozet. Since 1968, Creative Framing has been caring for the treasures of Central Virginia's finest homes. With over 2000 frame choices, and hundreds of matting options, Creative Framing is your source for fine framing and innovative designs. ​Today's movement toward oversize art is not the least bit daunting for us. Recent projects have approached eight feet in length. Our new delivery van makes transporting large artwork to your home or business possible. ​Floater frames for paintings on stretchers or panels are one of our specialties. Our choices range from quiet hand-rubbed American Walnut and Cherry to deep Gold Leaf Molded Corner options suited for the finest European paintings. ​Our designers have created special surroundings for fine paintings, antique samplers, modern collages, and treasured heirlooms. We source hand-crafted, Gold Leaf Moulded Corner frames from the finest American artisans. 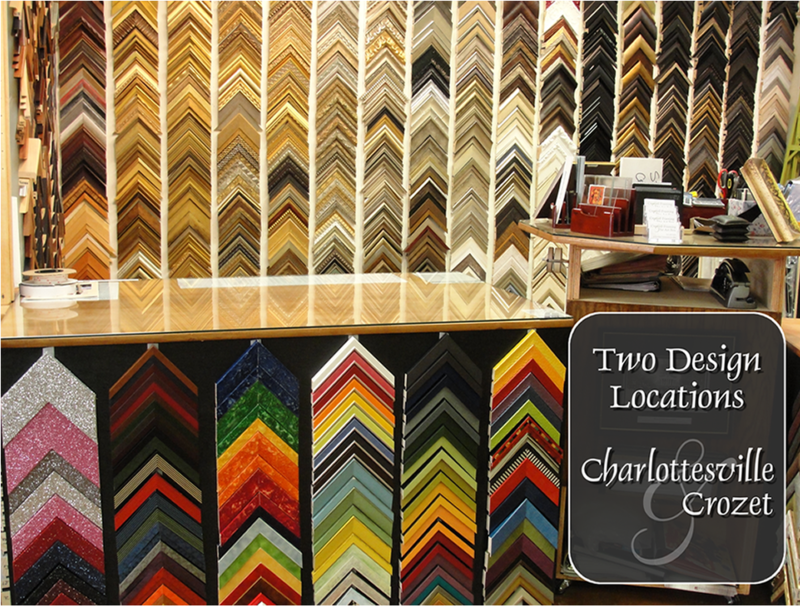 ​We pioneered Double Glass framing in the area back in 1987. Originally used for two sided objects like stock certificates and historic documents, the look of a glass mat is a popular option to make artwork look as if it is floating on the wall. ​ We stretch Needlepoint, Cross Stitch and Crewel Work, and shadowbox Coins, Weapons, Flags, Athletic Jerseys and Memories. ​Our experience includes handling Textiles from the hey-day of Versailles, Shadowboxes for Horse Trophies, and hand carved Ivory Jester Sticks used in Medieval Courts. We frame new and antique Oils, Engravings, Watercolors and Acrylics. ​We have framed a Rifle carried by John Wayne, and a Guitar carried by Dave Matthews. ​Decorators, Businesses, Universities and Hospitals appreciate our variety of design options and our ability to stay within their budgets. ​Connecting you with Conservators, Restorers, Movers, and Shippers to care for your treasures both at home and on the road is another service we provide. ​And the amazing part about all this, is that we are no more expensive than the beginner frame shops who have seen very few challenges. Time and again, customers come to us for an estimate and return for us to do the work, having compared the choices and prices available in the region. ​We love what we do, and we think it shows: in the quality of our work, the elegance of our design, and the joy we take in creating the product and working with our customers. Please come by and revel in our selection of possibilities.